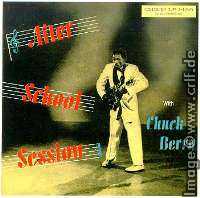 Although most of the material recorded during Chuck's work with the Chess brothers had been published until 1966, later re-issues and records provided additional material from these recording sessions. In addition there are some live recordings from this era which have not been released on Chess but on different labels many years later. This chapter will present you with the original Chess records first, followed by additional Chess recordings and out-takes published later. 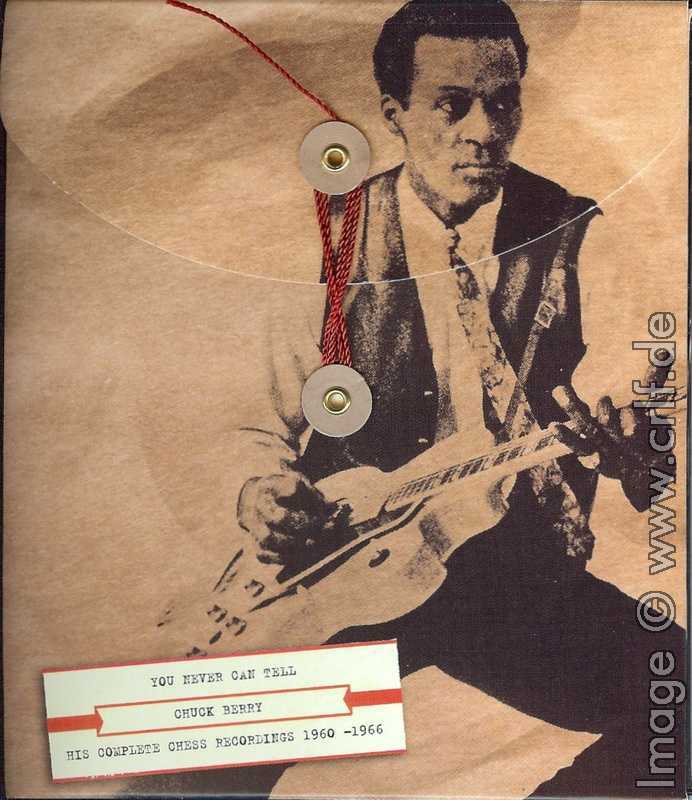 The chapter ends with a presentation of the live recordings between 1955 and 1966. 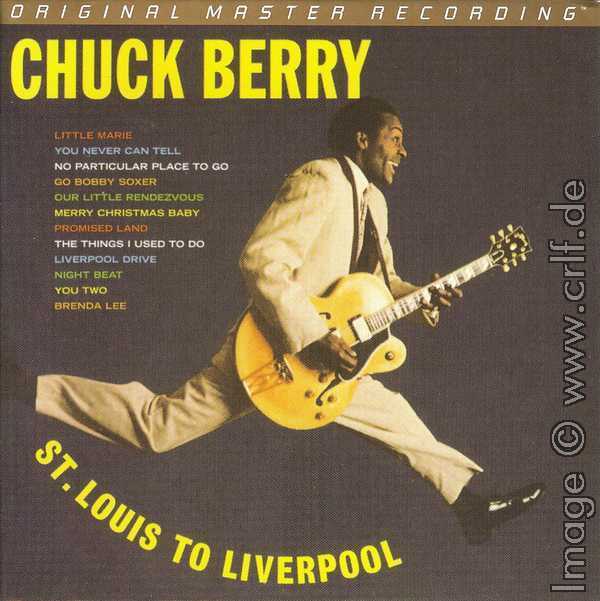 Chuck Berry's first recording session at Chess Records, Chicago took place May 21st, 1955. 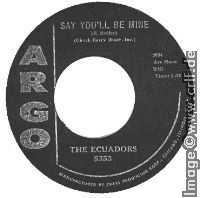 Four songs were recorded which were released on two 45/78 rpm records later that year: Maybellene b/w Wee Wee Hours (Chess 1604, July 1955) and Thirty Days b/w Together We Will Always Be (Chess 1610, September 1955). Due to the big success of these records (Chess 1604 became No. 1 in Billboard's Rhythm & Blues charts.) Chess organized another recording session in December of the same year which among other songs produced the next single No Money Down b/w Down Bound Train (Chess 1615, December 1955). 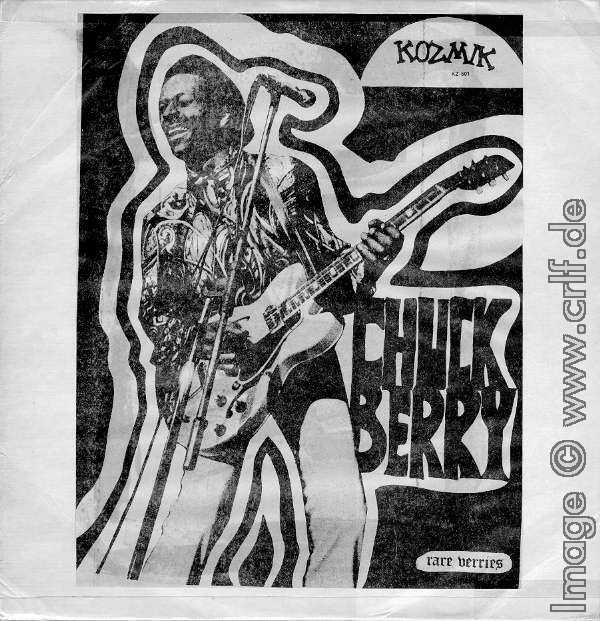 Important for collectors of Chuck Berry's Music is that this session also produced material which was not commercially enough to make it on a 45/78 rpm record. Roly Poly and Berry Pickin' were kept for publication on the After School Session album, while I've Changed remained unpublished until 1979. Since most single releases have been re-published on samplers multiple times, I will not list all the singles released during the Chess era. I will concentrate on the albums because most of them have been re-released several times (even on CD) and are easier to get for a collector. Of course many collectors also try to get all the 45/78 rpm records as well as the EPs Chuck made. Given his enormous output, even trying to get re-releases of all the albums is a major task for a collector. In 1956 Chess released three more singles followed by Chuck Berry's first album. The singles were Roll Over Beethoven b/w Drifting Heart (Chess 1626, May 1956), Too Much Monkey Business b/w Brown Eyed Handsome Man (Chess 1635, September 1956), and You Can't Catch Me b/w Havana Moon (Chess 1645, November 1956). 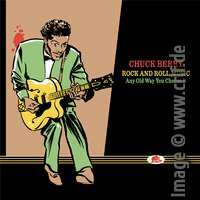 You Can't Catch Me is the song Chuck performed in the film Rock, Rock, Rock (Video: , DVD: ) also released in 1956. Due to this, Chuck's first album on Chess was named the same as the film: Rock, Rock, Rock (Chess LP-1425, December 1956). The album was sold as the motion picture soundtrack, which was not true, of course. 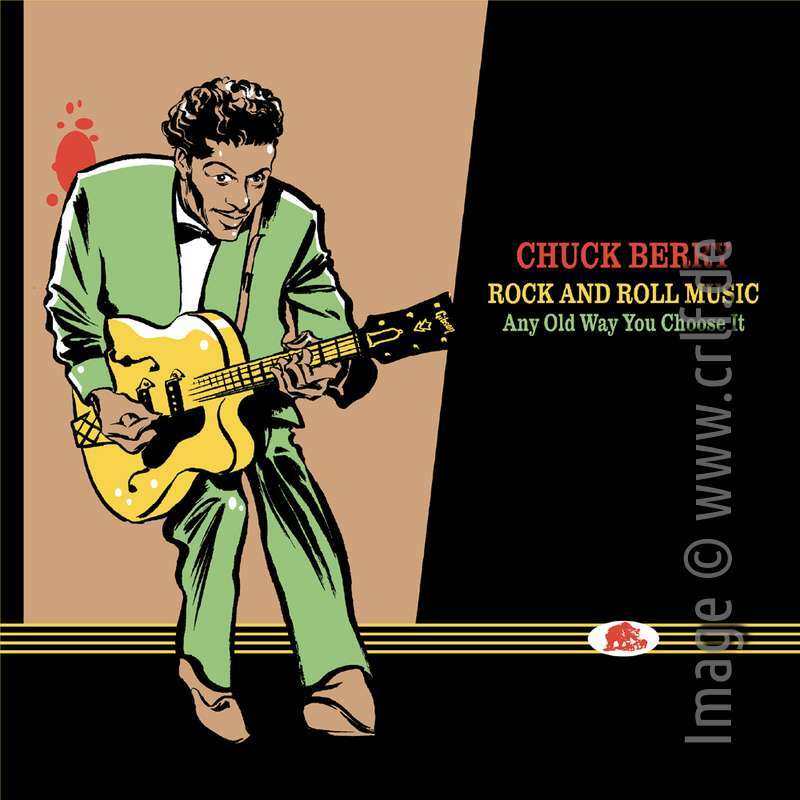 On one hand the film featured many other artists not contracted by Chess Records, on the other hand Chuck performs only one of the songs displayed on the album. Besides You Can't Catch Me the album contains Maybellene , Thirty Days , and Roll Over Beethoven . 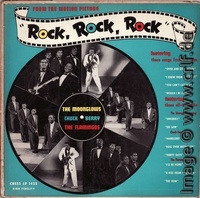 The remaining eight songs on Rock, Rock, Rock are performed by two successful groups from Chess: The Flamingos and The Moonglows. 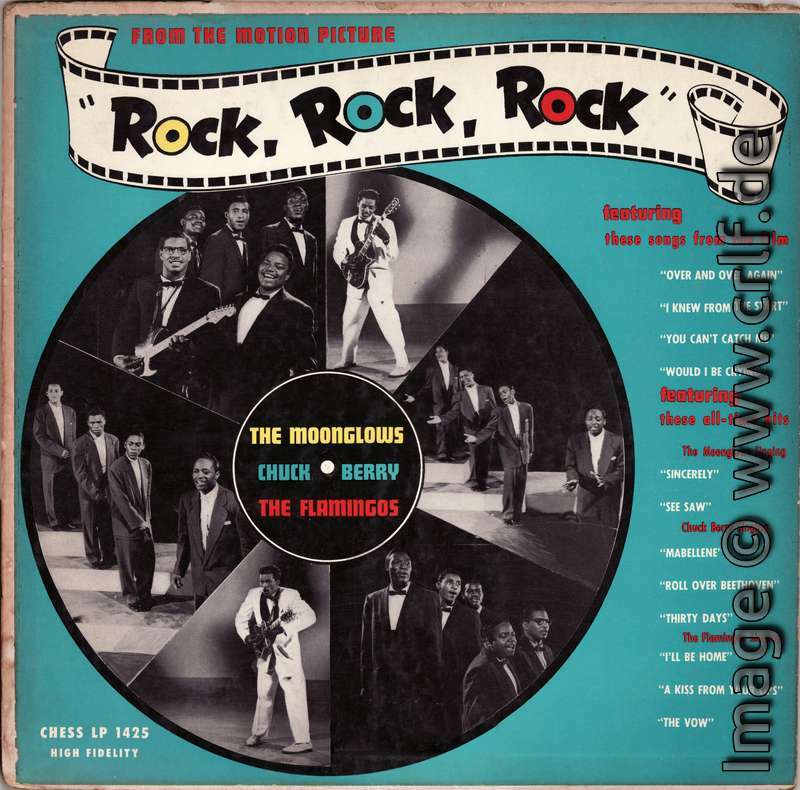 In a later Chess session the Moonglows sang background vocals for Chuck on tunes like Back in the USA . Rock, Rock, Rock has been re-issued on CD (Green Line CDCHESS 1016 ). Beginning with 1957 albums (LPs) became popular. 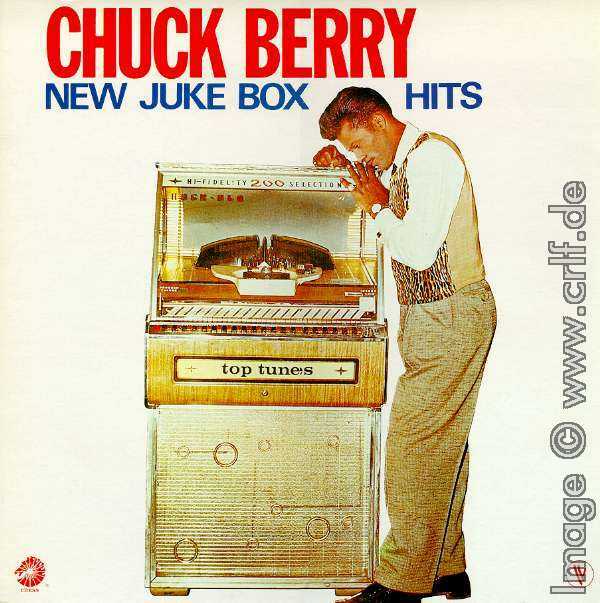 Also Chuck Berry's music now more and more appeared on albums instead of 45s/78s. In most cases LPs were a collection of an artist's hit singles. But pretty soon artists worked more and more for their albums which then started to contain many songs not published on singles. The first true Chuck Berry album was called After School Session (Chess LP-1426, May 1957 ). The record contains the remaining contents of the first six Chess singles. 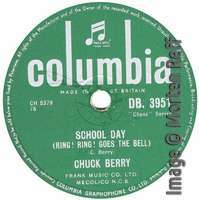 In addition the album contains Roly Poly and Berry Pickin' from Chuck second recording session at Chess plus the two songs from his latest single School Day [Schoolday (Ring Ring Goes the Bell)] b/w Deep Feeling (Chess 1653, March 1957). An EP (Extended Play record) of the same name (Chess EP 5118, May 1957) contains four songs from the album. Notable on this EP is the nice picture cover (right) designed by Don Bronstein, who also created many of the other sleeves you see here. Additional Chess releases in 1957 are Oh Baby Doll b/w La Juanda (Chess 1664, June 1957) and Rock and Roll Music b/w Blue Feeling (Chess 1671, September 1957). All four songs are also on the EP Rock and Roll Music (Chess EP 5119). Collectors should note that there are minor differences between the single version of La Juanda and the one on the EP which is subsequently re-issued on albums and CDs. 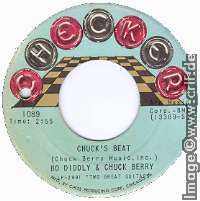 Starting 1957 the Chess brothers also began to license Chuck Berry's recordings to other record companies. In the beginning those companies only re-issued what had been hit records in the U.S. 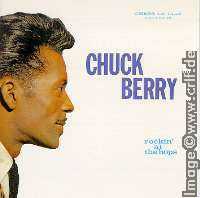 In later years however we find Chuck Berry recordings published outside the U.S. which had not appeared there. We will see some examples later. Here are two 1957 releases by Columbia Records of Great Britain and by London Records of Germany. 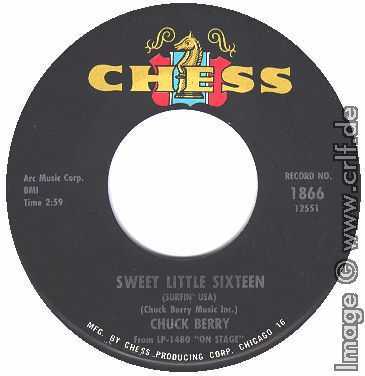 1958 started with one of Chuck's major hits: Sweet Little Sixteen b/w Reelin' and Rockin' (Chess 1683, January 1958). 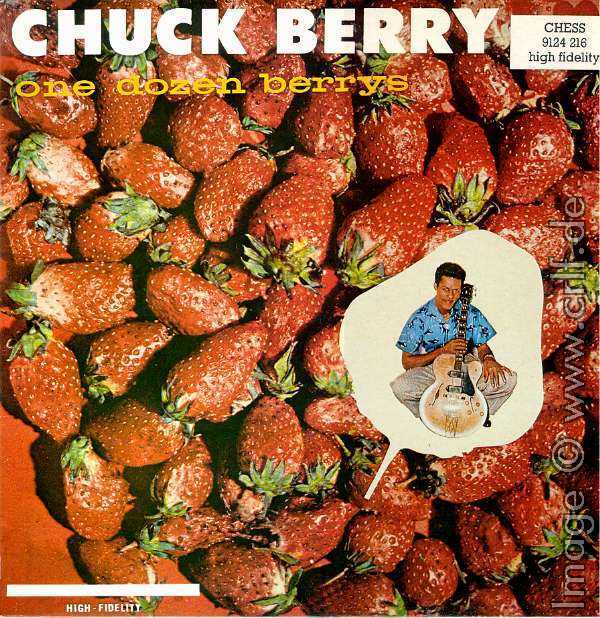 In March 1958 Chess released Chuck Berry's next album called One Dozen Berrys (Chess LP-1432 ). The album contained the six songs published since the release of the last album, though La Juanda appears in a different mix here. Blue Feeling is on that album twice: in its original form and at half speed entitled Low Feeling . Additional new songs on One Dozen Berrys are Guitar Boogie , In-Go , Rock at the Philharmonic , It Don't Take But a Few Minutes , and How You've Changed . 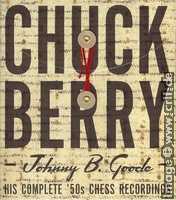 Also in March 1958 Chess released the next Chuck Berry classic: Johnny B. Goode b/w Around and Around (Chess 1691). Over the next year they published another six singles, most of the songs were then put on the next album Berry is on Top. The singles were Beautiful Delilah b/w Vacation Time (Chess 1697, both songs were rarities until they appeared on LPs in the Sixties and Seventies), Carol b/w Hey Pedro (Chess 1700), Sweet Little Rock and Roller b/w Jo Jo Gunne (Chess 1709), the Christmas songs Merry Christmas Baby b/w Run Rudolph Run (Chess 1714), Anthony Boy b/w That's My Desire (Chess 1716, another long-time rarity), and Almost Grown b/w Little Queenie (Chess 1722). 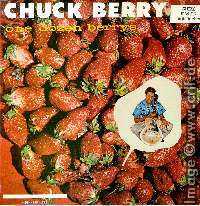 Berry is on Top (Chess LP-1435, July 1959 ) with the next strawberry cover was kind of a greatest hits sampler. It even contained the classics Maybellene and Roll Over Beethoven along with Almost Grown , Carol , Sweet Little Rock and Roller , Anthony Boy , Johnny B. Goode , Little Queenie , Jo Jo Gunne , Around and Around , and Hey Pedro . The only new song on this album is Chuck's nice Blues For Hawaiians . 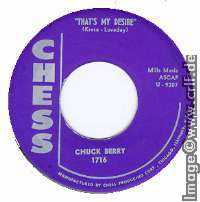 Shortly before Berry is on Top Chess released another Chuck Berry classic: Back in the USA b/w Memphis, Tennessee (Chess 1729). It's interesting to note that Memphis was released on the B-side of this single only and that it made it neither to the Berry is on Top album nor to the following one. Additional Chess releases in 1959 and 1960 were Broken Arrow b/w Childhood Sweetheart (Chess 1737), Too Pooped to Pop b/w Let it Rock (Chess 1747), Bye Bye Johnny b/w Worried Life Blues (Chess 1754), and I Got to Find My Baby b/w Mad Lad (Chess 1763). All eight songs were put on the following Chess album Rockin' at the Hops. The album Rockin' at the Hops (Chess LP 1448 ) was released in July 1960. 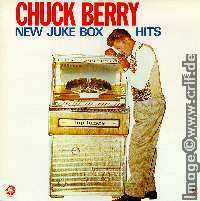 It contained the eight songs listed above plus four additional songs, three of which not written by Chuck. The new songs were Down the Road Apiece , Confessin' the Blues , Betty Jean , and Driftin' Blues . 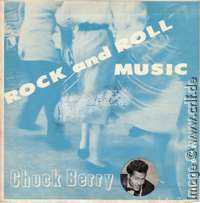 The same LP was also published outside the U.S. under the name Rockin' With Chuck (Chess International PAR 031). 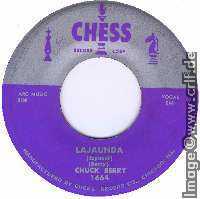 The single Jaguar and the Thunderbird b/w Our Little Rendezvous (Chess 1767, October 1960) ended Chuck Berry's 1960 releases. In 1961 Chess released only two 45 rpm records: I'm Talking About You b/w Little Star (Chess 1779, February 1961) and Come On b/w Go Go Go (Chess 1799, October 1961). Due to Chuck's trials during this year, interest in his records was low. This also holds true for his next album New Juke Box Hits (Chess LP-1456, March 1961 ). As there were no singles, the album contains a lot of material which has not been available elsewhere for a long time. New Juke Box Hits includes cover versions of hits by Nat Cole, B. B. King, Tampa Red, and Little Richard (Route 66 , Sweet Sixteen , Don't You Lie to Me , and Rip it Up ) as well as some new Chuck Berry: I'm Talking About You , Diploma For Two , Thirteen Question Method , Away From You , The Way it Was Before , Little Star , Run Around , and Stop and Listen . Then something strange happened. A new generation of musicians became very successful: The Beatles, The Rolling Stones, The Beach Boys, et cetera. And they played ... Chuck Berry music. And they told everyone that it was Chuck Berry music they play. 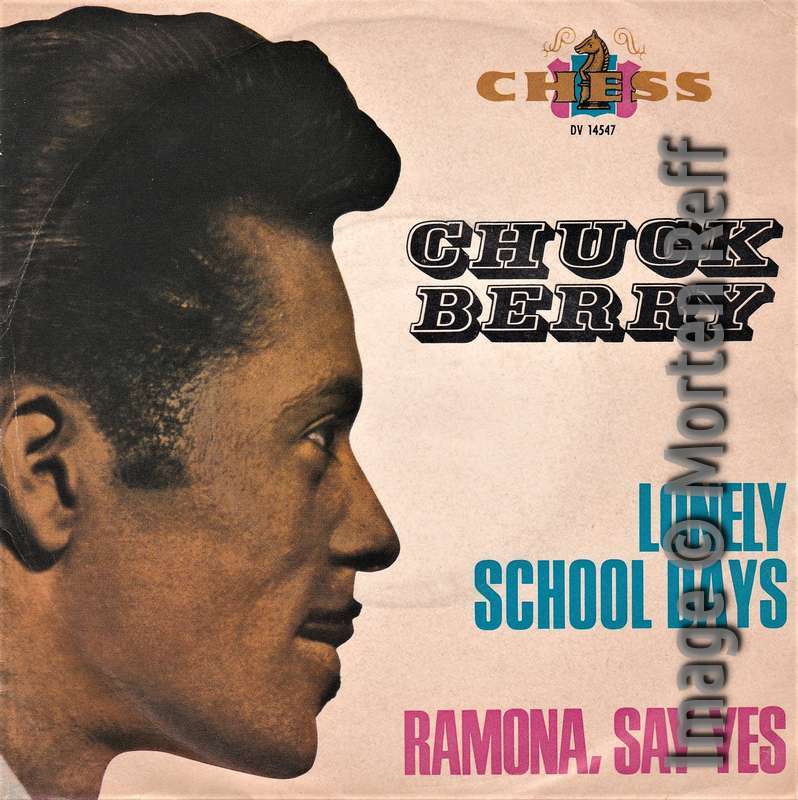 So in August 1963 the Chess brothers took from their archives what hasn't been released so far and created a Chuck Berry album with new songs. For some reason they also thought that this album would sell better if it sounded and looked like it was recorded live on stage. 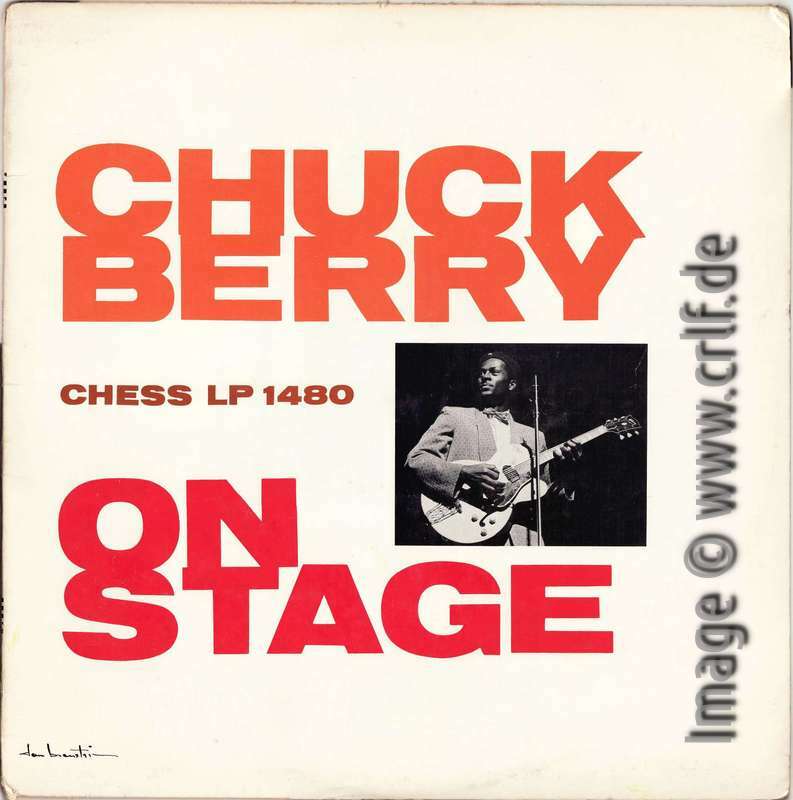 So they dubbed live audience to the tapes and called the album Chuck Berry On Stage (Chess LP-1480, August 1963). Of course this was a lie just like the note including Surfin' USA. Chuck Berry never recorded Surfin' USA even though the Chess Brothers concurrently released a 45 rpm single with Sweet Little Sixteen (subtitled Surfin' USA) b/w Memphis (Chess 1866), again both titles 'enhanced' with fake audience. We all know that it were the Beach Boys who covered Sweet Little Sixteen and added their own lyrics. Chuck Berry On Stage contains the well-known hit versions of Maybellene (mis-spelled Maybelline), Memphis , Let it Rock (re-titled Rocking on the Railroad), Go Go Go , Sweet Little Sixteen (re-titled Surfin' USA), and Jaguar and the Thunderbird . In addition the album includes a new version of Brown Eyed Handsome Man and the new songs Surfin' Steel (a version of Blues For Hawaiians originally recorded and later published as Crying Steel), Still Got the Blues , I Just Want to Make Love to You , All Aboard , Trick or Treat , and The Man and the Donkey . Not listed on the US cover but also included is a recording of How High the Moon . As said all these songs were modified to sound like recorded with audience. Undubbed versions of most of these songs became available on albums in the Seventies and Eighties. 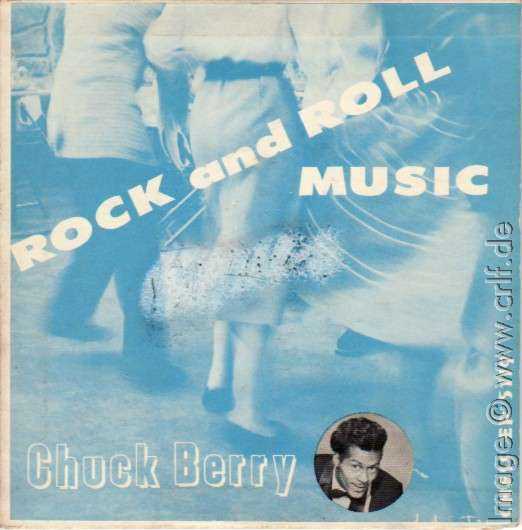 While Chuck Berry On Stage has been re-issued under various titles many times, there is one version of this album which is of special interest for the Chuck Berry collector. 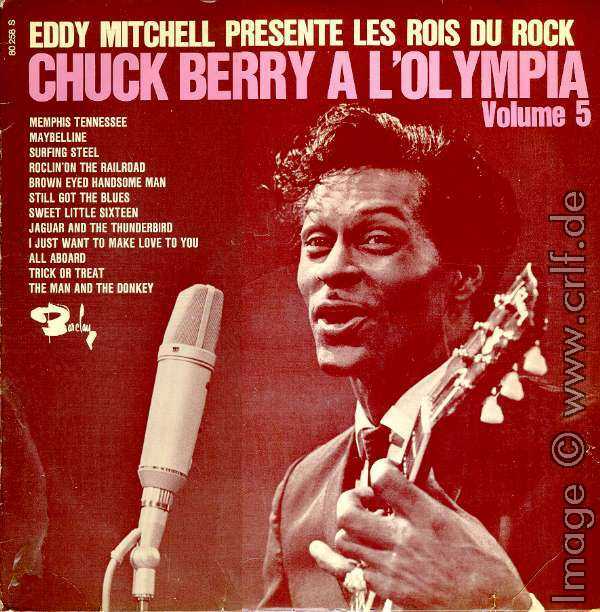 The French variant Chuck Berry A L'Olympia (Barclay 80258, March 1965) contains not only a French language introduction to the 'show' on the LP (the original version and all re-issues contain an English language introduction), but also true live recordings from Chuck. However these are not songs but just some of the introductions recorded during a French live show (and of course completely unrelated to the songs of the album). Due to these additional segments, one song on each side (Go Go Go and How High the Moon ) is omitted. It would be really nice to finally release the original recording the French introductions were cut from. 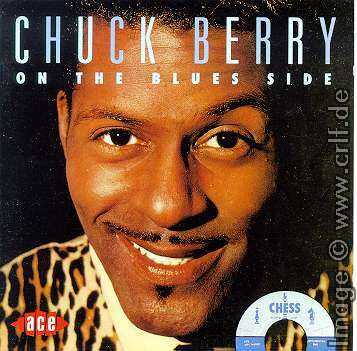 Back from prison, Chuck Berry returned into the Chess studios. In early 1964 Chess Records released the first true new songs: Nadine b/w O Rangutang (Chess 1883) and No Particular Place to Go b/w You Two (Chess 1898). 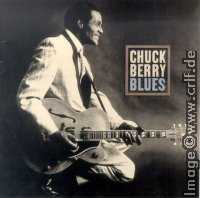 Those were accompanied by a new album Chuck Berry's Greatest Hits (Chess LP-1485) containing nothing new. 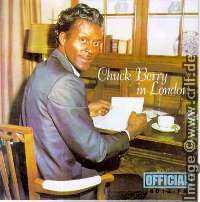 In England however, Pye Records now created their own albums which corresponded to the huge interest in Chuck Berry on this side of the Atlantic Ocean. 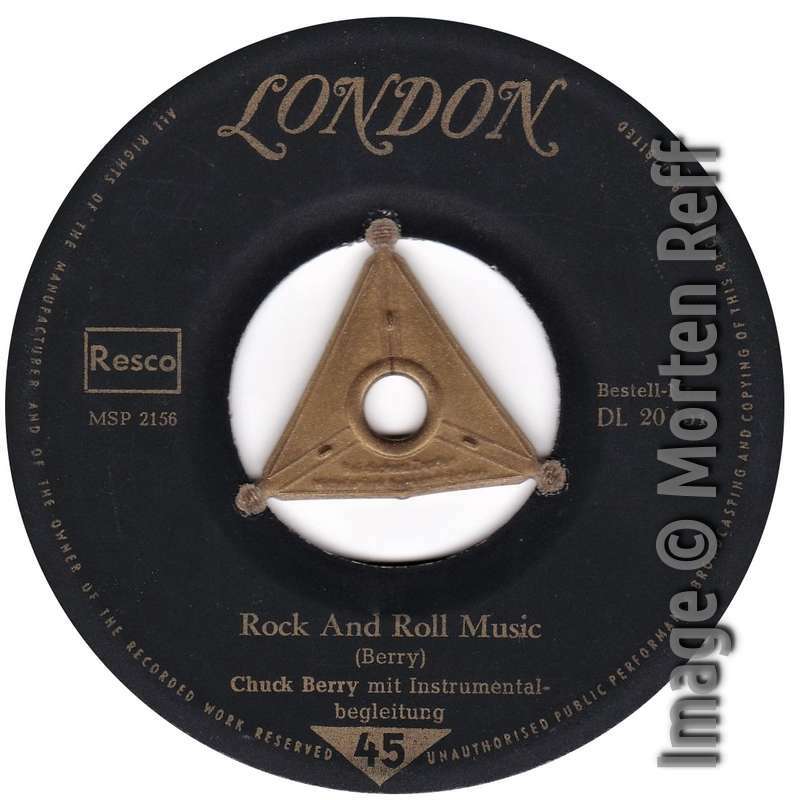 The records published by Pye International often contained material that was not released in the U.S.
A first example was More Chuck Berry (Pye NPL 28028, December 1963 ), which included the rare single Beautiful Delilah . Then came The Latest and the Greatest (Pye NPL 28031, May 1964 ). 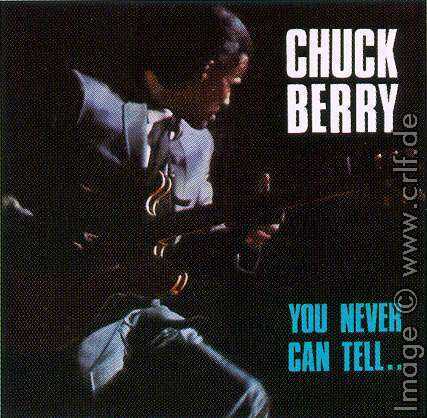 This record included some old numbers (Deep Feeling , Guitar Boogie , Driftin' Blues , Bye Bye Johnny , Don't You Lie to Me , and Jaguar and the Thunderbird ) together with the four songs from the latest Chess singles. And it included unreleased material: Fraulein , Lonely All the Time (a.k.a. Crazy Arms ), Things I Used to Do , and specially for England the Liverpool Drive . Later that year Pye released another LP called You Never Can Tell (Pye NPL 28039, September 1964 ). This one contained the songs from a new Chess single: You Never Can Tell b/w Brenda Lee (Chess 1906) coupled with well-known classics (Diploma For Two , The Way It Was Before , Around and Around , Back in the USA , Run Around , Reelin' and Rockin' , and Come On ). In addition the record contained three new songs: Promised Land (to be released in the U.S. in November 1964), The Little Girl From Central , and Big Ben Blues . The two Pye LPs have been re-released on a single CD BGOCD428 by BGO . However, there is a small difference between this re-release and the originals. O Rangutang on the CD is in its complete length, while it was shortened on the original singles and albums. Meanwhile in the U.S. the Chess brothers again published two Chuck Berry numbers not on their Chess label, but on another label. 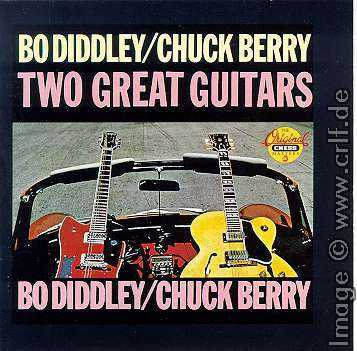 Two Great Guitars (CHECKER 2991, August 1964 ) basically contains two jam sessions of Chuck Berry together with Bo Diddley and Chess session artists. The so-called Chuck's Beat lasts 10:40 minutes, Bo's Beat even longer: more than 14 minutes. The record was filled with two other instrumentals, Liverpool Drive (Chuck only) and When The Saints Go Marching In (Bo only). The album has been re-issued by MCA (CHD-9170, 1992) containing three more Bo Diddley numbers as well as Chuck's previously unreleased Chuckwalk . Another re-release without this bonus track is part of the CD Two Great Guitars/Super Super Blues Band by BGO. 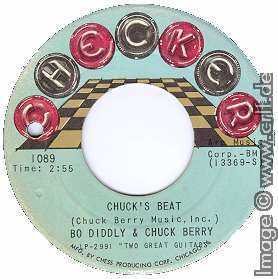 Chuck's Beat b/w Bo's Beat was also released as a 45 rpm single (CHECKER 1089), both jams shortened to less than 3 minutes, however. These edits have been only available on the hard-to-find single until the 16-CD box Rock And Roll Music - Any Old Way You Choose It (Bear Family BCD 17273 PL , 2014). In September and November 1964 Chess Record's released Little Marie b/w Go Bobby Soxer (Chess 1912) and Promised Land b/w Things I Used to Do (Chess 1916). The same month also saw the next Chess album. Due to Chuck's success in England, it was consequently called St. Louis to Liverpool (Chess LP-1488, November 1964 ). The album contained many of the 1964 songs that yet had to appear on an LP in the U.S.: Little Marie , Our Little Rendezvous (from 1960), No Particular Place to Go , You Two , Promised Land , You Never Can Tell , Go Bobby Soxer , Things I Used to Do , Liverpool Drive , and Brenda Lee . There was only one new song on this album called Night Beat . And there was Merry Christmas Baby . 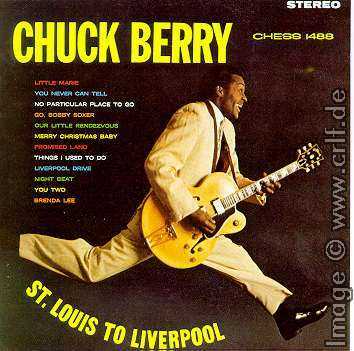 Originally released on Chess 1714 in December 1958, this song re-appeared on the St. Louis to Liverpool album. But for some reason, Chess used a different recording (alternate take) from the same session for inclusion here. This makes Chess-LP 1488 an important collector's item. 1965 started with the release of Dear Dad b/w Lonely School Days (Chess 1926, March 1965). While the funny Dear Dad was also used for the upcomming album, this version of Lonely School Days was a long time rarity until re-released in the Nineties. 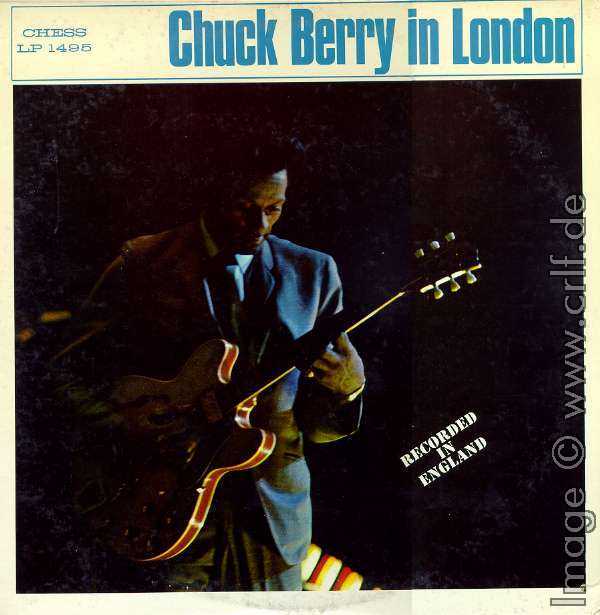 Still building on Chuck's success in England, the next Chess album was called Chuck Berry in London (Chess LP-1495, April 1965 ). And although the U.S. cover included a big note Recorded in England, this was only true for eight of the songs included. Except for Dear Dad and Night Beat all recordings on this album were brand new (although some songs were known before by other artists): My Little Love-Light , She Once Was Mine , After It's Over , I Got a Booking , His Daughter Caroline , You Came a Long Way From St. Louis , St. Louis Blues , Jamaica Farewell , Butterscotch , The Song of My Love , Why Should We End This Way , and I Want to Be Your Driver . Important for collectors is that the UK version of this album (Chess CRL-4005) contained a slightly shortened version of She Once Was Mine and a different take/mix of Jamaica Farewell . The album has been reissued with additional material recorded live in England 1964. 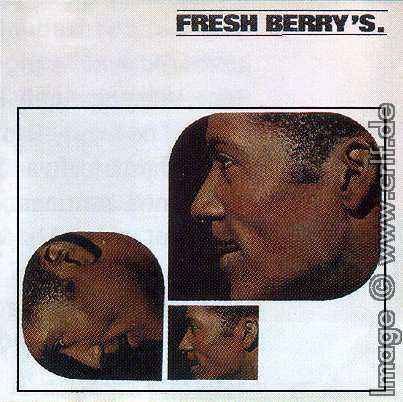 Fresh Berry's was released in the UK as Chess CRL-4506 (left, November 1965 ) and in the U.S. as Chess LP-1498 (right, April 1966). Again, both records are not exactly the same. Where the UK release contains the song Sad Day - Long Night , the U.S. version contains the song Welcome Back, Pretty Baby . The remaining songs are the same on both albums: It Wasn't Me , Run Joe , Everyday We Rock and Roll , One For My Baby , It's My Own Business , Right Off Rampart Street , Vaya Con Dios , Merrily We Rock and Roll , My Mustang Ford , Ain't That Just Like a Woman , and the Wee Hour Blues . In June 1966 Chuck Berry left Chess Records after having worked for them eleven years. 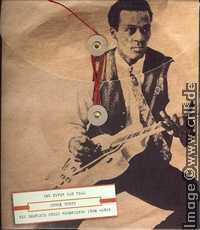 The same month Chess published the last of Chuck Berry's original Chess releases: Ramona Say Yes b/w Lonely School Days (Chess 1963, image shows the picture cover of the German issue). For collectors this is another important record since Ramona Say Yes was not available in other form until the late Eighties. 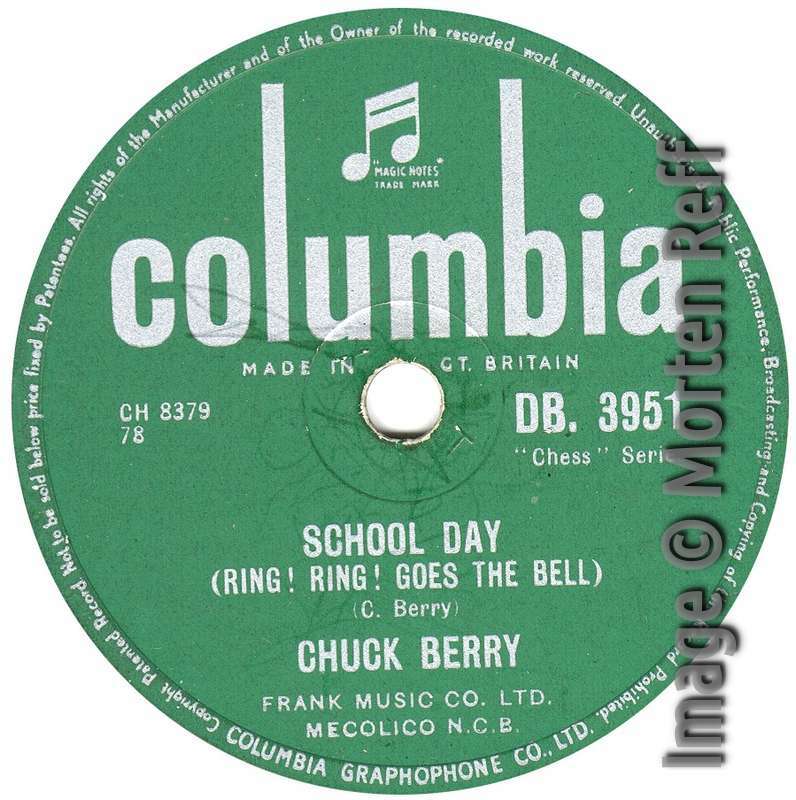 Lonely School Days is important, because this version is a completely different recording than the one issued on Chess 1926 one year earlier. And of interest is that Chess 1963 was also published with the 1956 version of Havana Moon instead of Lonely School Days . 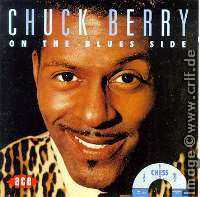 Chuck Berry returned to Chess Records in November 1969, recording another set of albums and singles. I will dedicate a whole chapter to this Back-At-Chess Era. 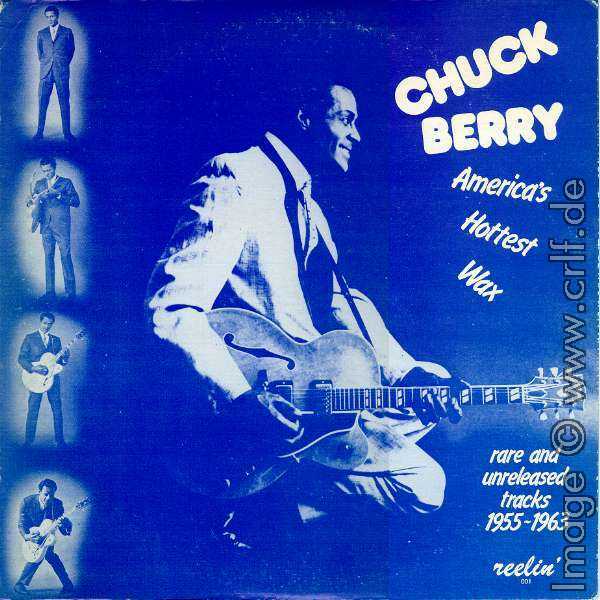 However, between 1955 and 1966 Chuck recorded more songs and versions than just those that have been published by Chess Records/Pye in the U.S. and England. In later years re-releases of Chess material not only contained the big hits and the well-known songs, records also displayed music from the original Chess tapes which had not been released before. This section will list all the songs recorded at the Chess studios that have been published after 1966. Chess Records themselves was among the least active companies to publish such material. 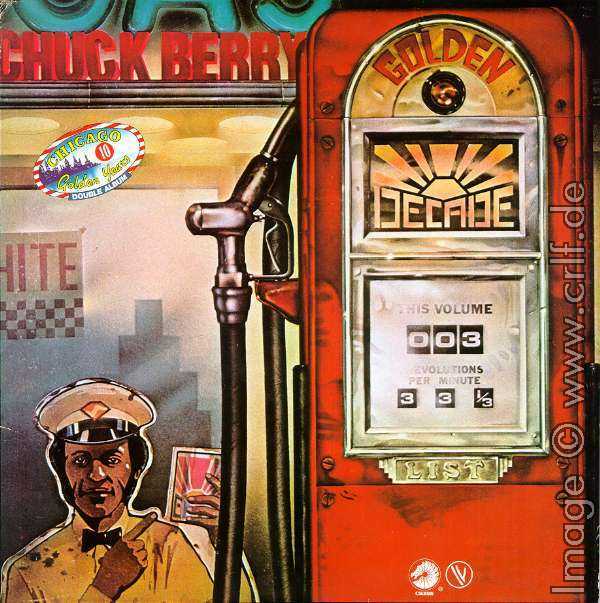 Their only use of the Chuck Berry archive was the release of the 2-LP set Chuck Berry's Golden Decade which was no more than a Best Of collection. In England Pye Records re-used their archives on their Marble Arch Records sub-label. 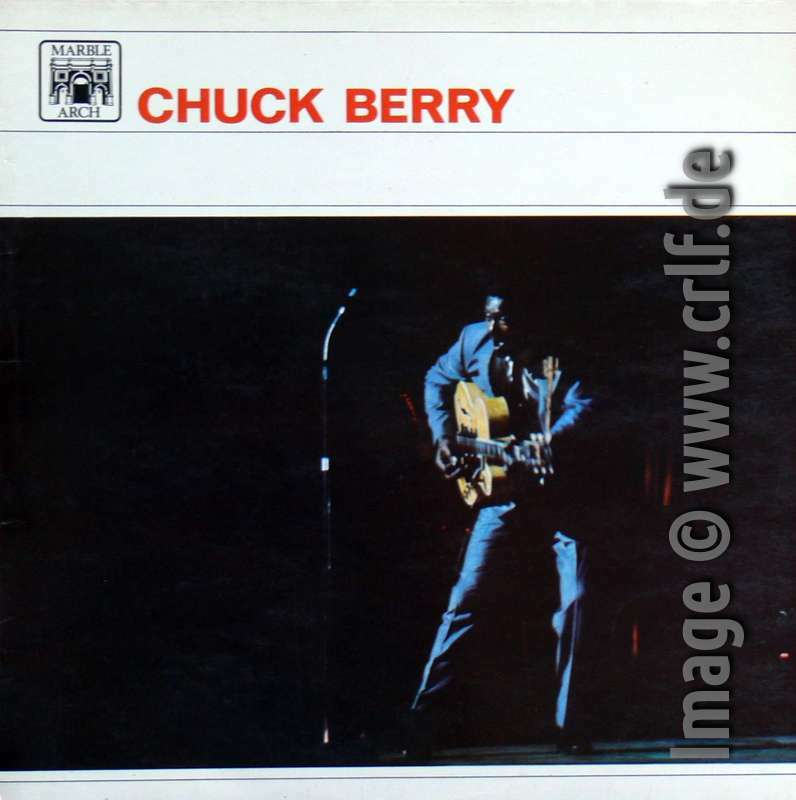 In 1966 and 1967 they published three Chuck Berry records containing material from their first four UK albums: Chuck Berry (MAL 611), Chuck Berry's Greatest Hits (MAL 660), and You Never Can Tell (MAL 702). All three Marble Arch albums were available in mono and stereo versions. 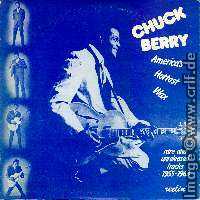 The stereo version of MAL 611 (named MALS 611 on the label) was of interest for the serious Chuck Berry collector. This version contains an alternate take of Come On and a different recording of Around and Around . While this version of Come On was re-released later by MCA, the version of Around and Around , which has a different guitar overdub, could be found only here until in 2008 MCA/Universal began to re-release Berry's Chess work in total. Well, almost, as there also was MAL 702 from 1967. MAL 702 is one of the strangest Chuck Berry albums ever. This is due to the fact that there are three different records with the same name and number. First there is a Mono version of MAL 702. It contains 10 songs. Second there is a Stereo version MALS 702. It contains the same ten songs, though in true Stereo, even those that were released in Mono only before. And third there is another Stereo version of MALS 702 which contains twelve songs, although both cover and label list only ten. The two additional songs are Come On and Around and Around from MALS 611. Two other rare songs recorded at Chess prior to 1966 made it to the 1971 release of San Francisco Dues (Chess LP 50008): Viva Viva Rock 'n' Roll was previously unreleased, while Lonely School Days is the version from the Chess 1963 single. 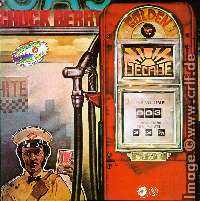 The remaining songs from San Francisco Dues have been recorded after Chuck's return to Chess in 1970. 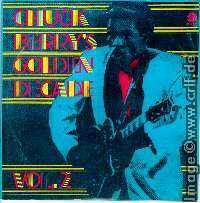 In February 1973 Chess Records released Chuck Berry's Golden Decade Vol. 2 (Chess LP 60023, image shows the cover of the UK version). 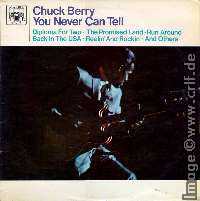 This 2-LP set contained lesser known songs from Chuck's Chess era. All of them were published before, except for Betty Jean Carol and Let it Rock . The first is an alternate take, the second and third are alternate mixes different from the ones released before. Carol has an additional piano overdub while Let It Rock misses the guitar overdub known from the hit version. Since the cover doesn't make a note on these two, it seems like someone just took the wrong tapes to master. Another variant of Carol containing a different piano overdub was published the same year on a Japan-only album called From The Beginning 1955-1960 (CHESS SJET-9523-5). 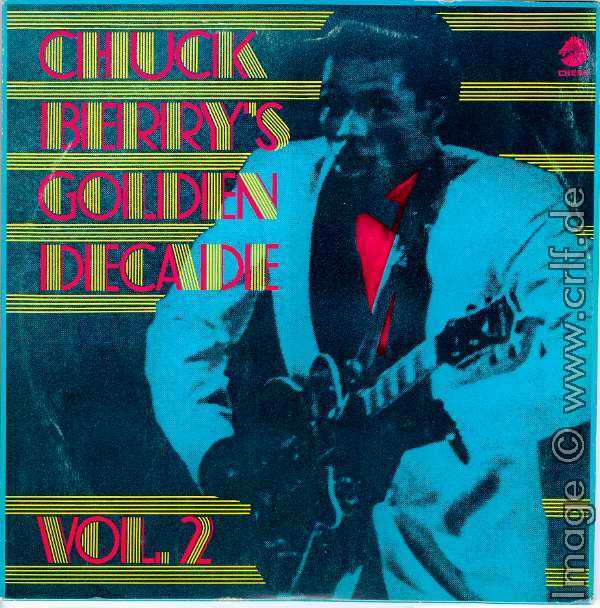 However, the next release Chuck Berry's Golden Decade Vol. 3 (Chess LP 60028) by intention contained unreleased material. Taken from the Chess archives were these five songs previously unpublished: Blue On Blue , County Line (a version of Jaguar and the Thunderbird ), House of Blue Lights , Time Was and Oh Yeah . 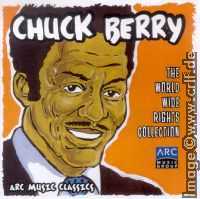 Also included is the original version of The Man and the Donkey without the live audience dubbed onto Chuck Berry On Stage. The UK version of this record (Chess 6641.177, same cover) has a slightly different contents on record two, side two. Instead of Viva Viva Rock And Roll and Time Was this release contained Berry Pickin' and the otherwise unreleased Do You Love Me . In the remaining Seventies and early Eighties the Chess archives were sold several times, but none of the official owners was able or willing to release anything but the well-known classics. 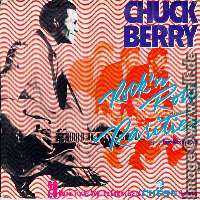 Looking for Chuck Berry rarities you had to watch the release of private records a.k.a. bootlegs. 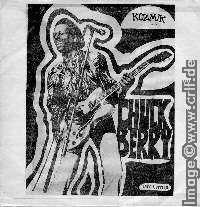 The first Chuck Berry bootleg was Rare Berries (Kozmik KZ-501) which contained rare tracks from his early albums, though nothing new. For more information about this record read the corresponding blog article. 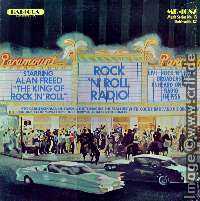 Then in 1979 America's Hottest Wax (Reelin' 001, image shows a later picture cover) appeared. This record contained a lot of rare and unreleased material. For details about this bootleg look at the blog which supplements this page. Along with the two songs published under the Ecuadors name on Argo 5353, you could find unreleased alternate takes of Rock and Roll Music , Childhood Sweetheart , Do You Love Me , Reelin' and Rockin' , Sweet Little Sixteen (Demo version), Vacation Time (two variants labeled 21 and 21 Blues ), and Thirteen Question Method . 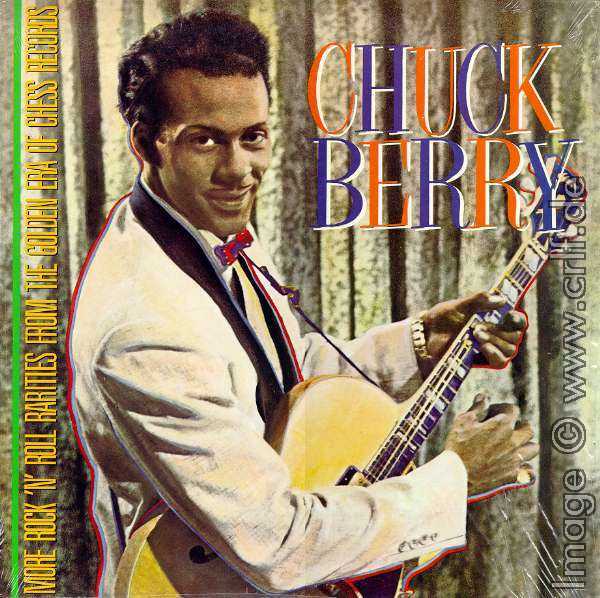 There were Brown Eyed Handsome Man and How High the Moon from the Chuck Berry On Stage album less overdubs, and there were two completely new songs: I've Changed , and One O'clock Jump . This record was so important and successful that it was re-released by Chess Records themselves as Chess Masters (Chess CXMP 2011, March 1983). In 1985 MCA Records bought the Chess archives. In addition to producing a new album and film with Chuck (Hail! Hail! Rock 'n' Roll), MCA made true use of the archives. They re-released many original albums, and they published some albums/CDs containing rare or previously unreleased material. Rock 'n' Roll Rarities (Chess LP 92521, March 1986 ) is a 2-LP set. However, it only contains five versions of songs not heard previously. These are alternate takes of Sweet Little Sixteen , Rock And Roll Music , Johnny B. Goode , Beautiful Delilah , and Little Queenie . Collectors should be aware that some of these versions were glued together from different unreleased takes. The most part of this album is used by remixes of known songs. This means that MCA used the original tapes but mixed them in a new fashion to show true Stereo. The Stereo versions on Rock 'n' Roll Rarities are: Bye Bye Johnny , Nadine , You Never Can Tell , Promised Land , No Particular Place to Go , Little Marie , I Want to Be Your Driver , It Wasn't Me , and Ain't That Just Like a Woman . The remaining songs were either well-known or previously published on one of the albums listed here. The same holds true for the following album called More Rock 'n' Roll Rarities (Chess LP 9190, August 1986). Here you'll find only two new versions: alternate takes of Sweet Little Rock and Roller and Route 66 . Stereo remixes are included of I Got to Find My Baby , Down the Road Apiece , I'm Talking About You , Go Go Go , and My Mustang Ford . The Chess Box (Chess 80001, 1988 ) is a box of six LPs or three CDs/cassette tapes. More important to the collector is it because of the nice booklet than because of new songs. On the six LPs there are only two songs that have not been published before, I'm Just a Lucky So and So , and a different recording of Time Was . 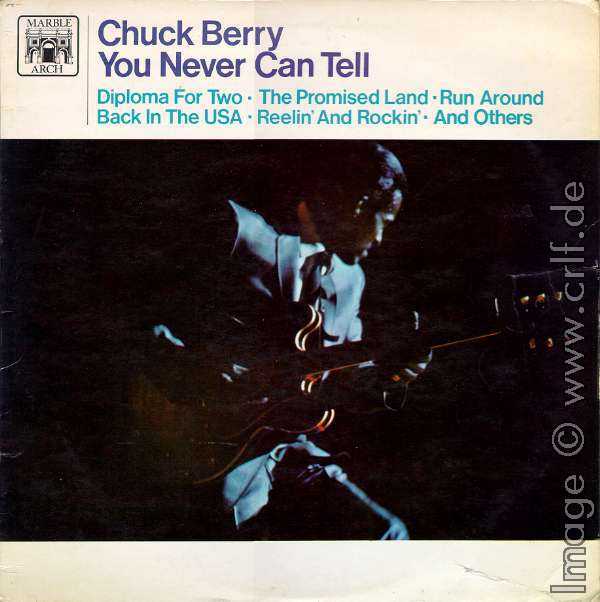 In addition you'll find Surfin' Steel from the Chuck Berry On Stage album, here without audience overdub and as originally named Crying Steel . And there is a version of Ramona Say Yes without the added saxophones. 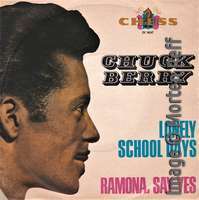 Two years later Chess published a third volume of the Rock 'n' Roll rarities series called Missing Berries, Rarities Vol. 3 (Chess CHD-9318, June 1990 ). Again there wasn't much new contents. There's only one song previously unissued which was so unknown it didn't even had a name. So it's listed as Untitled Instrumental . The remaining songs are only rare in that they had not been published on LPs in the U.S. In 1992 MCA re-issued the album Two Great Guitars on CD (CHD-9170). 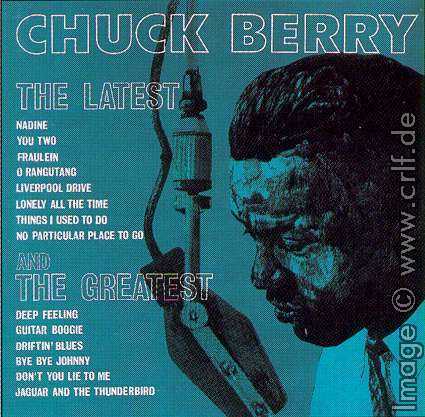 In addition to the original tunes this CD contains four more songs, one of them the previously unreleased Chuckwalk by Chuck Berry. The other three numbers are by Bo Diddley. To find more previously unreleased material from Chuck's Chess era one needs to listen very carefully to re-releases or compilations. This way you could encounter three versions of songs not heard before: Still Got the Blues , I Just Want to Make Love to You , and All Aboard had been published before only on the Chuck Berry On Stage album with fake audience dubbed. They can be heard in their original form on the CDs On the Blues Side (ACE CDCH 397 ) by ACE Records (released in 1993, containing the first two) and Blues (MCA B0000530-02) ) by MCA Records (released in 2003, containing all three). Both CDs also contain many other nice Blues numbers by Chuck. 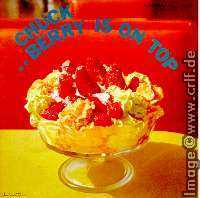 In 2004 another CD surfaced containing two additional recordings from Chuck's Chess era: Adulteen and I'm in the Twilight Zone (incorrectly listed as "I'm in the Danger Zone"). The ARC Classics (ARC Music Group ARC CB 0402) however could not be bought in shops. 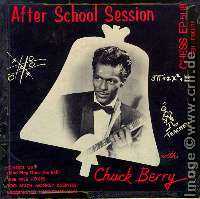 It was a not-for-sale promotional item distributed by ARC Music, the publishers of a larger set of Chuck Berry songs. For details see the section on Radio Show and Promotional Records. In addition to 13 recordings by Chuck himself, the CD presented cover versions by The Groovie Ghoulies, Emmylou Harris, Carson City Playboys, Dr. Feelgood, Taj Mahal, and Nina Simone. 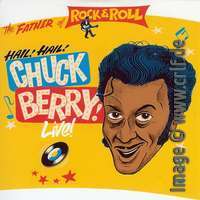 As a bonus the CD contains the single Chuck Berry song not recorded by himself: Hey Good Looking was written for and performed by Bo Diddley. While we were all waiting for MCA, now part of Universal Music, to make better use of the Chess archives, Andy McKaie of Universal and British author Fred Rothwell went through all the old tapes waiting in the Chess vaults to find out whether there would be anything of interest not yet published before. And in early 2008 Hip-O Select, one of Universal's labels, released a first result of this tremendous work. 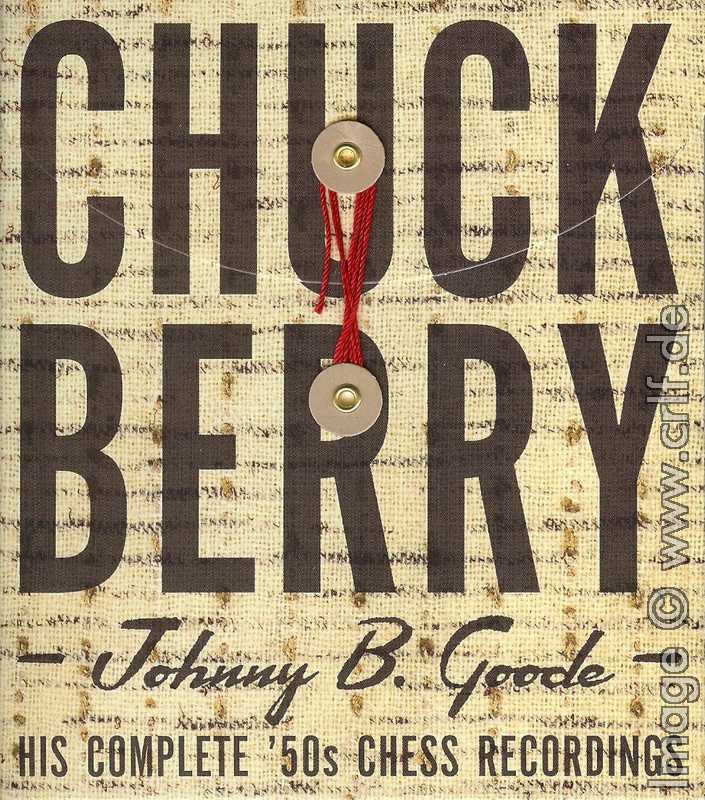 Johnny B. Goode - His Complete '50s Chess Recordings (HIP-O-Select B0009473-02 ) contains everything the title promises: All of Berry's recordings for Chess from May 1955 to December 1959. Besides being a complete compilation of everything known before, this 4 CD set even came with a multitude of recordings previously unreleased. Most importantly there are two lengthy jam sessions recorded in September 1958. Besides this Long Fast Jam and Long Slow Jam the CD set includes 14 previously unknown alternate takes, in addition to the alternate takes already on records such as Rock 'n' Roll Rarities. Here we newly find additional takes of Sweet Little Sixteen , Night Beat , Time Was (slow version), Reelin' and Rockin' , Around and Around , Ingo , 21 , Almost Grown (two different takes ), Blue on Blue , Betty Jean , I Just Want to Make Love to You , Broken Arrow , and Too Pooped to Pop . Also to be noted is that the version of Around and Around which was only to be heard on the strange Marble Arch 12-instead-of-10 song record is included as well, of course. 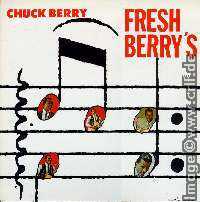 The 103 tracks on this 4 CD set cover Berry's complete work for Chess up to December 1959 including the Ecuadors tracks and the two 1956 live recordings descibed below. So this was the ultimate collection of everything Berry ever recorded for Chess in the 1950s - we were told. But it is still helpful to carefully listen to new releases. This is how collectors found out about take 6 of Anthony Boy. It was not included in the four CD box above, but made it to the 2008 re-release of Berry Is On Top / St. Louis To Liverpool (Mobile Fidelity UDCD 776 ). Mobile Fidelity remastered the contents of the two Chess albums from the original tapes. So they thought. But by accident, for Anthony Boy the wrong tape was used. 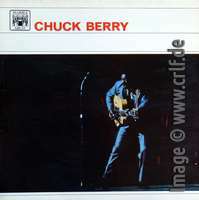 In addition careful listeners encountered that some of the previously known alternate takes of Sweet Little Sixteen and Johnny B. Goode were missing from the 4-CD set. In 2009, a second set of Chess masters was released. You Never Can Tell - His Complete Chess Recordings 1960-1966 (HIP-O-Select B0012485-02 ) contains everything from the next six years, that is everything up to the end of this page's era. Again this four-CD set contains everything listed above with one single exception: I'm in the Twilight Zone from the ARC promo above is missing on this set. Instead there is an alternative take called I'm in the Danger Zone included. Other alt. takes can be heard of Go Go Go and His Daughter Caroline . Previously unknown songs are Spending Christmas , Honey Hush , and an 1965 recording of Shake, Rattle & Roll . Also included are instrumental versions of Wee Wee Hours , My Mustang Ford , and Brown Eyed Handsome Man . And there's the last song previously only available with dubbed audience. Trick or Treat . 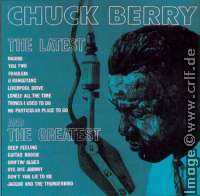 The highlight of this release is a 45 minute performance of Berry recorded by Chess in 1963 (see below). 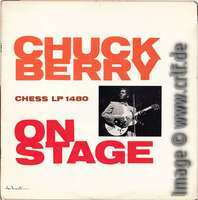 These CD sets for now summarize Berry's complete studio work for Chess up to 1966. Many of the well-known Chess recordings have been modified and re-published with fake applause. These variants have been used often on budget LPs to make them more interesting. 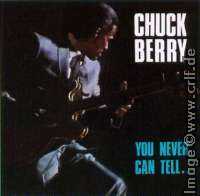 Chess never published a true live recording by Chuck Berry until The Chuck Berry London Sessions in 1972. 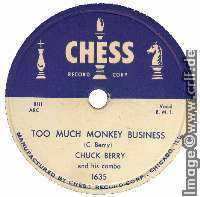 However, there are live recordings made during Chuck's early Chess era, and some of them are available on records or CDs. In 1978 Radiola re-published broadcasts originally made for CBS Radio (Radiola MR-1087, also on WINS 1010). 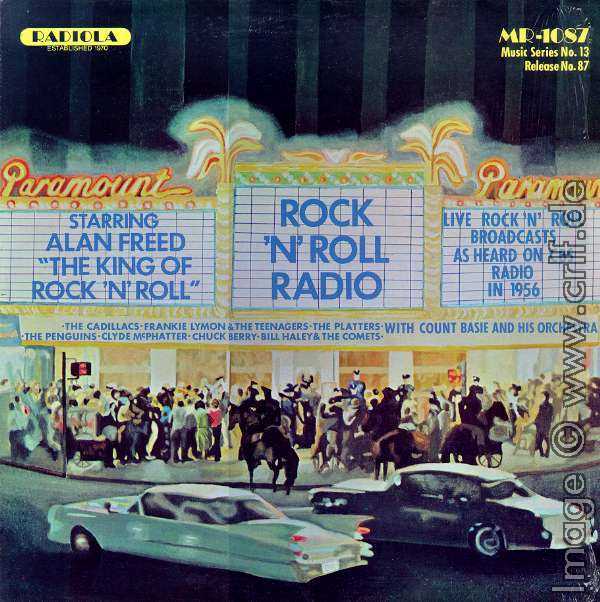 These recordings were cut during live shows conducted by DJ Alan Freed in May and June 1956. There are many big stars of the 1950s performing their greatest hits. 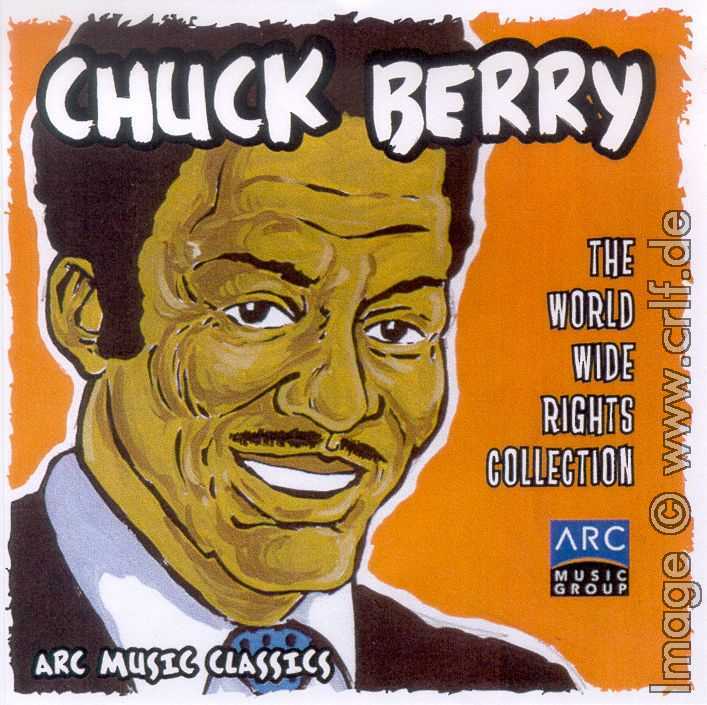 Chuck Berry can be heard singing and playing Maybellene and Roll Over Beethoven . 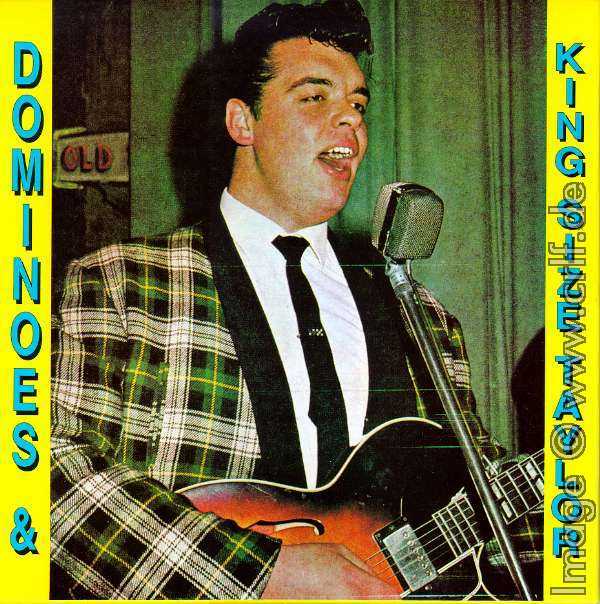 The two live cuts have been re-issued on CD several times, for instance on Magnum Force CDMF075 They also made it to the 4-CD set Johnny B. Goode - His Complete '50s Chess Recordings (HIP-O-Select B0009473-02 ), though HIP-O-Select used a broken tape copy for Roll Over Beethoven. 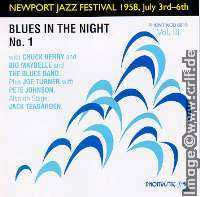 Two years later (July 5th, 1958) Chuck performed at the Newport Jazz Festival. Parts of this show have been published in 1992 by Phontastic (PHONT NCD 8815 ) as Blues in the Night, No. 1. On this CD Chuck is introduced to the audience and then performs School Day, No Money Down, Sweet Little Sixteen, and Johnny B. Goode. The performance of Sweet Little Sixteen has also been filmed by Bert Stern and used in his concert film Jazz on a Summer's Day (Video , DVD ). As such it is also included in Charly Records' soundtrack CD (Jazz on a Summer's Day, Charly CDGR 196 ). And the same recording can be found on the CD Our Little Rendez-Vous (WOLF 2120 CD ), this time however obviously taped directly from the movie, which means at terrible sound quality. 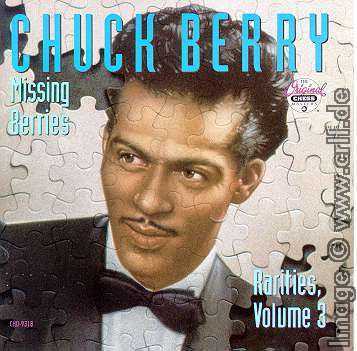 In October 1963 Chess Records cut four Chuck Berry shows at the Walled Lake Casino, Detroit. These recordings remained unreleased until most of the third and fourth show were included on the four-CD set You Never Can Tell - His Complete Chess Recordings 1960-1966 (HIP-O-Select B0012485-02 , 2009) This 45 minute live performance included very interesting versions of Guitar Boogie , Let It Rock , Almost Grown (! ), Johnny B. Goode , Sweet Little Sixteen , Wee Wee Hours , and Maybellene . Several included dialogs show Berry telling jokes to the audience. And probably the best part of this concert is the closing medley of Goodnight Sweetheart Goodnight/Johnny B. Goode/School Day which runs for 11 minutes. All four shows including the segments which were excluded here were then released in their whole on the Bear Family 16-CD set noted above. 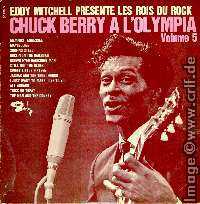 An additional live recording of Chuck Berry from his early Chess era was recorded in May 1964 for the British BBC Saturday Club radio show. 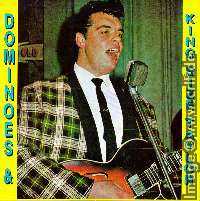 These recordings appeared first on the 4-LP set Dominoes & King Size Taylor (Merseyside's Greatest MGBOX 801005, published 1980). Here you find Brian Matthew of BBC (British Broadcasting) interviewing both Chuck Berry and King Size Taylor, and you hear Chuck and the Dominoes performing Memphis, Sweet Little Sixteen, Nadine, and Johnny B. Goode. Unfortunately on this vinyl album only the last song can be heard in full, the other three songs are on the album only in excerpts. Memphis Tennessee and Sweet Little Sixteen plus a recording of School Days could later be found in their full lengths on the CD described next, though the sound quality on the LP is a lot better than on the CD. In 2014 Bear Family's 16-CD box finally contained all these recordings in full length and full quality. 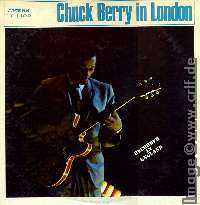 Early in 1965 Berry toured Europe again. On February 6th he recorded a live performance broadcast on RTB, the Belge TV station. 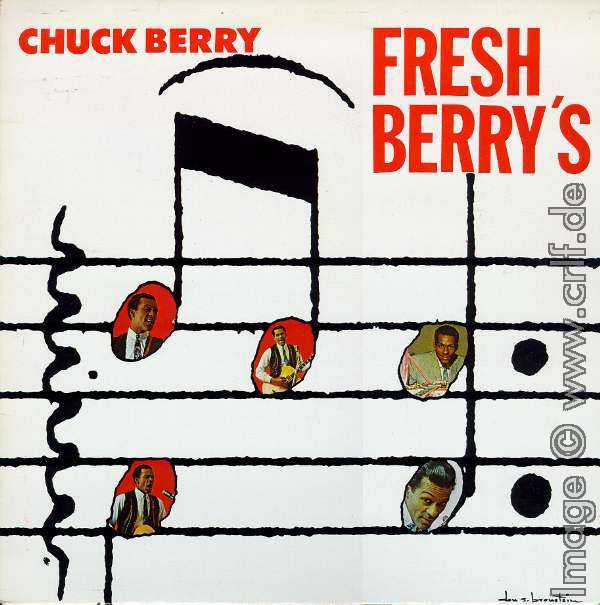 Berry was backed by four good jazz musicians and performed seven numbers: Maybellene, The Things That I Used To Do, Roll Over Beethoven, Memphis, Tennessee, No Particular Place To Go, Promised Land, and Johnny B. Goode. These recordings have been available on video for years. In 2017 a high-quality audio of this show became available on a CD called Hail! Hail! Chuck Berry! Live! (Rough 640509040147 , 2017). Further recordings made 1965 in England have been published in 2000 (although the CD says 1994) on a CD called Chuck Berry - His London Recordings (Official 4012-FS ). 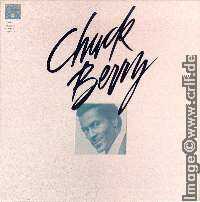 The CD contains most songs from the album Chuck Berry in London and also uses the original cover of the Dutch version of this album. 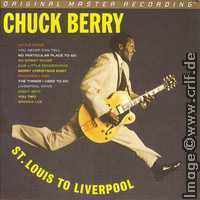 In addition the CD contains another three Chuck Berry songs related to England: Liverpool Drive , Big Ben Blues , and London Berry Blues . Next to three of the 1964 recordings just described, you'll also find Nadine, Promised Land, and No Particular Place to Go recorded in February 1965 for the BBC Top Gear radio show. For some reason the three recordings are repeated, though they sound a bit different due to the bad recording.